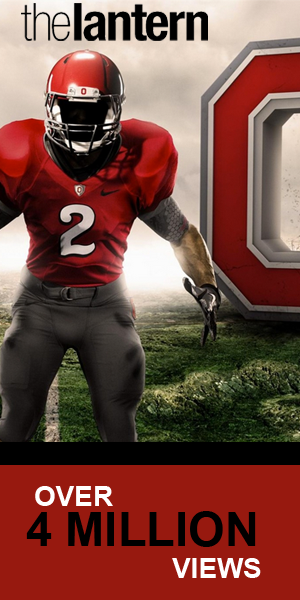 One out of 20 Ohio State students is black. One out of every 12 residents of the University District is black. Yet when University Police were responding to suspicious activity in 2016, one out of every three of the subjects of those field interviews was black. 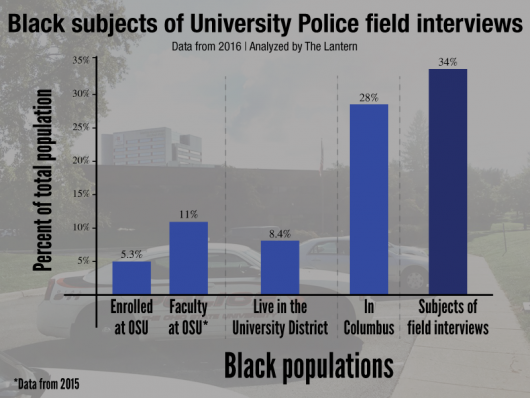 Black subjects, when compared to Columbus’ and Ohio State’s overall population, made up a disproportionate number of field interviews conducted by University Police in 2016, according to a Lantern analysis of the 933 field interviews made last year. 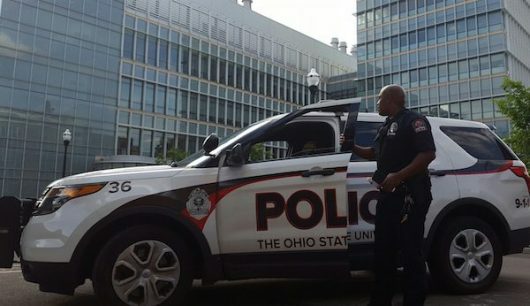 Of the 1,684 traffic stops conducted by University Police, black subjects were overrepresented as subjects of traffic stops when compared with the demographics of OSU’s student and employee population, as well as the population of the surrounding neighborhoods — though not compared to city-wide demographics. The findings come on the heels of a new statewide policing standard that will require all police departments to collect race and gender data for anyone pulled over in traffic stops or questioned in field interviews. University Police had already been collecting the data since 2013. 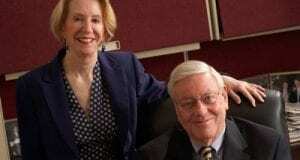 Of the 933 field interviews, 34 percent involved black subjects. In 2015, 33 percent of field interviews involved black subjects. In the report where the 2016 data was collected, University Police offered multiple explanations for the racial disparities, including accounting for Columbus’ black population, which makes up 28 percent of the city’s residents. Administration and Planning spokesman Dan Hedman highlighted the report’s findings in his responses to The Lantern as well. At OSU, black drivers were involved in 15 percent of all traffic stops. 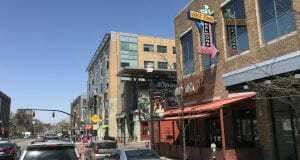 OSU’s black student population is 5.3 percent of the student body, while the black population in the University District, comprised of the campus and surrounding neighborhoods, is 8.4 percent of the total population. The number of field interviews and traffic stops involving black subjects was addressed at length in the administrative review itself — obtained by The Lantern in a public records request — as multiple paragraphs are dedicated to explaining the reasoning for such discrepancies. No corrective measures were taken and there were no reported citizen concerns of bias in 2015 or 2016, according to the report. The review, written by Capt. David Rose, who heads the patrol bureau, attributes the higher rate of black subjects interacting with police mostly to the surrounding campus area and Columbus’ black population, which is 28 percent of the total population. “Roads passing through campus represent a convenient passage between surrounding communities so non-affiliates are likely well-represented in the sample,” Rose wrote in the review, referring to those not affiliated with the university as employees or students. While the 2016 review did not record the OSU-affiliation of those pulled over or who were the subject of a field interview, the 2015 administrative review did. It found that 82 percent of field interviews involved nonstudents and nonemployees. Since that data is no longer reliably kept, it is impossible to see the percentage of field interviews that are with students and employees. 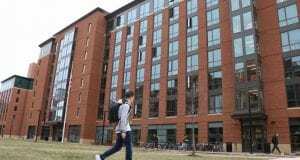 Rose’s reasoning for the racial discrepancies is that the university area is open for nonaffiliated people to pass through, which accounts for the 6-percent gap between Columbus’ 28 percent black population and the percentage of field interviews carried out on black men and women, 34 percent. The proportion of traffic stops in which the subject was black — 15 percent — is lower than the 28 percent total city’s black population. However, Census data from 2010 shows that the ZIP codes bordering the University District have a smaller black population than Columbus as a whole, although the most recent census data available is older and subject to unreported changes between 2010 and 2016. The University District, the area that University Police patrols with some overlapping jurisdiction with the Columbus Division Police, is made up primarily of two ZIP codes, 43210 and 43201. This can be separated as on-campus and off-campus living areas, respectively. OSU’s campus has its own ZIP code, 43210, which is 7 percent black, according to census data. 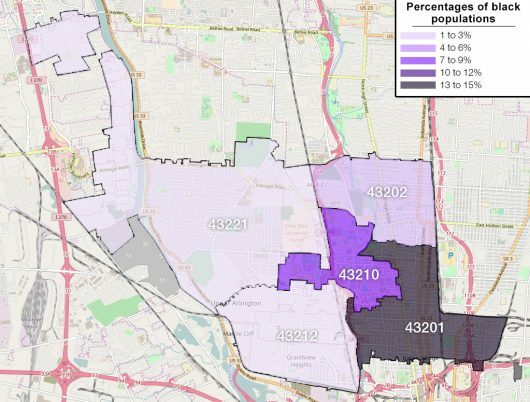 The surrounding ZIP code, 43201 — which stretches several blocks north of Lane Avenue down to the Short North and from roughly State Route 315 to Interstate 71 — is 14 percent black. 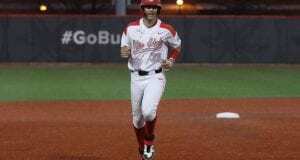 Together they make up the University District, the most densely populated area in Columbus. As defined by city code, the University District’s boundaries are Fifth Avenue to the south, Glen Echo Ravine to the north, train tracks to the east and the Olentangy River to the west. The neighboring ZIP code to the north, 43202 — which includes Riverview, the northern portion of the University District — is 4 percent black. 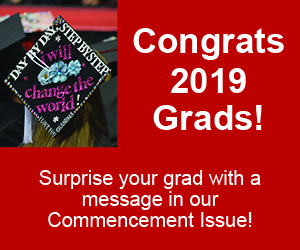 To the west, 43212 — which includes Hillside and a large segment of Upper Arlington — is 3 percent black and ZIP code 43221 — which largely includes the northwest portion of campus — is 2 percent black, and shares a significant border with OSU’s ZIP code as well. The 2016 review also says the number of black university employees could affect the racial ratio in University Police’s traffic stop data. However, according to a diversity report from 2015 done by OSU’s Office of Human Resources, black employees make up 11 percent of the total employees at OSU. Additionally, the review shows that Asian drivers are getting pulled over at a disproportionate rate, and the report offers explanations for why that could be as well. 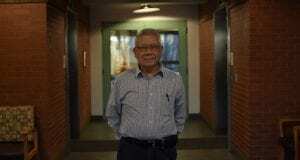 The OSU Asian student population is about 6 percent of the total student body, and the Asian population of the University District is 9 percent of the total. 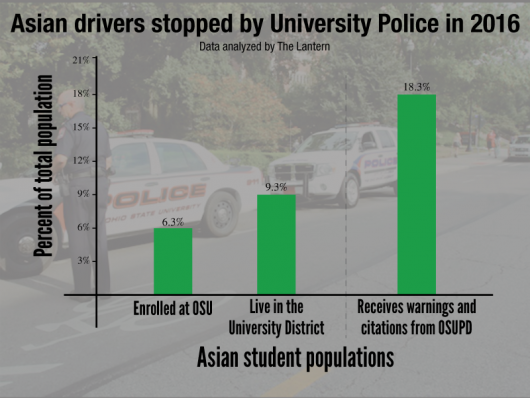 However, Asian drivers make up 18 percent of total warnings or citations by University Police. As Ohio’s police departments begin to record race and gender during stops, Ronnie Dunn, an associate professor of urban affairs at Cleveland State University who helped craft the new policing standard, said the hope is that transparency and accountability is brought across the board. “This helps us better understand exactly who the police are having interactions with,” Dunn said. Misleading headline, or more accurately, a headline that is a flat out lie. Read the article where it states that the numbers of blacks stopped is consistent with the racial make-up of the campus area. 33 t0 34% of stops, 28% black population. Furthermore, it is within a margin of error for typical resident surveys. 5-7%. This headline is disgraceful and is a blatant attempt to shock readers and malign the police. 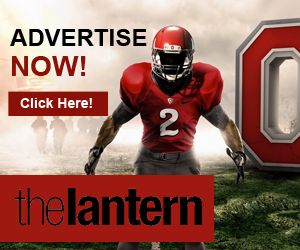 The Lantern continues to be a mouthpiece for a liberal agenda. Sadly it no longer is journalism. Did you read the part addressing how the surrounding area is less in percentage than the Columbus percentage? How about not getting upset about an article that seeks information, displays it, and seeks to hold institutions accountable. What percentage of “suspicious person” reports telephoned into OSU PD’s dispatching center list blacks as the suspicious person? 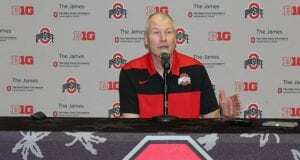 Are OSU police simply responding to the reports of OSU’s students and faculty? What percentage of robbery suspects, known burglary suspects or other reported criminal suspects are black? Does the percentage of suspicious person stops look like the percentage of blacks listed as suspects in these crimes? What percentage of stops or interviews resulted in a citation or an arrest? Three things: What race percentage were the victims of the crimes in 2015/2016? Also, this data shows OSU students continue to be the target of criminals from the Columbus area. Stop focusing on the alleged perpetrators and give more attention to the victims of the “suspicious persons” involved in alegend criminal activity.